Picking the book of the month for February was a very tough decision; I read so many great books over the last couple weeks that I dithered quite a lot (which is also why I'm late posting this.) 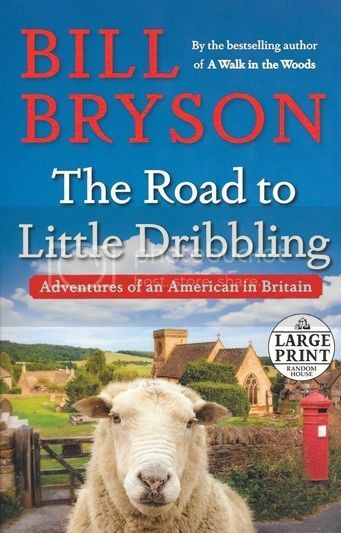 I finally went with the book that made me laugh and learn and love our cousins across the pond just a little bit more: The Road to Little Dribbling by Bill Bryson. I admit, I will buy anything Bill Bryson writes -- right down to his grocery list -- but this book was a particularly special delight. About twenty years ago the author knocked about the UK while writing Notes from a Small Island, which you may not know went on to become one of the bestselling travel books of all time. This book is sort of a sequel to that, but also so much more. Mr. Bryson once more travels the length of Britain from Bognor Regis to Cap Wrath, which as the crow flies is well over 500 miles. Along the way he revisits some of the places he wrote in the 90's, but also discovers some new spots he missed back then. For most of the book I felt as if I was walking through all these places with the author, and listening to him as he told me stories about the people and buildings and history of each spot. I have no idea how he digs up such obscure yet fascinating facts. He's often grumpy, primarily about the unhappy changes that have transformed a great many British towns and cities, but he's also hilarious when he points out some bumbling thing he did. When he described his first UK job working in a genteel mental asylum I was pretty much riveted. I felt like arguing with him over certain opinions of his, but I've got family over there, including my cousin Juanita, who gave up her U.S. citizenship to become a Brit. My loyalties probably lean more east than west. The murderous anecdote that begins Chapter 14 isn't really meant for dog-lovers, or to be taken seriously. During his stop in Alderley Edge near Manchester, he dropped a tiny, almost obligatory David Beckham anecdote. It wasn't his to tell, but still illustrated what a neat guy Beckham is, so I didn't mind. Also, if you've never been to the UK some of the things he talks about might zoom over your head, but I think most well-read folks would enjoy this book. I could only get the paperback in large print edition, which I usually don't do -- and know I think I will, especially with Mr. Bryson's densely-written books. The large print did make it a lot easier to read. Thanks for the recommendation. I'm a library volunteer and deliver audio books, DVDs & large print books to an elderly lady who is unable to get out much. This would be just up her street, so I'll be popping over to our local library web site to check it out. It is an excellent book, but I did wonder if people who have never been to Britain would get much of it. Glad to see it didn't all go over your head. BTW: A person does not need to give up US citizenship to become a Brit; you can have dual nationality.